My cousin and I throw a 4th of July party for our birthday boys every year. The theme is of course, 4th of July (Red White and Blue), but because they are kids we decided to try to pick a secondary theme each year to keep it creative. This year we did a Tie Dye theme which can be used for birthday party’s year round- just replace RED WHITE and BLUE- with your own color scheme. First up- invitations! We took some beautiful patriotic pictures in the park with the kids holding flags. Out of all the photo shoots we do every year, this one is always my favorite. These two take the best pictures together although the watermelon picture we captured last year in 2016 is going to be hard to beat. The night before the party my cousin (who is also my cake decorating partner) and I, worked on a beautiful tie dye cake. We wanted to try air brushing fondant with a tie dye stencil, but after that failed, we improvised and still managed to make a beautiful tie dye cake for our boys using the stencil and dabbing on red and blue food coloring. Because you can’t have a tie dye party without shirts, we got a range of t-shirts in different kid sizes. My cousin had stumbled upon directions for tie dying that instructed us to use zip ties instead of rubber bands. Neither of us had ever done tie dye this way… but it was way easier than rubber bands so I highly recommend it! We used an American flag pattern for our zip tie layout. To create this design you grab the left corner of your shirt and close your zip ties on a bit of an angle, making the first section a little bigger than the others. We had aprons and gloves for the kids although most of the kids wore their bathing suits. When putting the dye on the wrapped up shirts, we made the first section blue and then alternated between red and white (no dye) for each shirt. Once the kids dyed their shirts we put them in plastic bags with an instruction card for their parents to follow when washing out their shirts. You can save this picture and use these instructions for your own tie dye party. After the tie dye activity, the kids had a water balloon fight in the front yard while we set up our drive way theater in the garage. We had tested out our drive way theater last year. But unfortunately, the projector only worked when the sun went down and because we wanted to watch fireworks at sundown, this year we wanted to figure out a way to play our movies earlier. We invested in a black-out tent and it worked like a charm. Now we can play movies at any time of the day. The only problem we had with the tent was that it felt a bit hot so we are hoping to invest in a way to cool it down a little for next year. After we put on Finding Nemo for the kids who wanted to stay and watch, we served some popcorn and grilled some snacks. My sister made a very festive s’mores dip that was a big hit. You layer the bottom of the pan with chocolate and top it off with sugar covered marshmallows. We cooked in on the grill but it can also be melted in the oven. Then you put out gram crackers and everyone can help themselves to this creative treat. Before the sun went down, we came up with a genius game where the kids compete to see who can pick up the most popped water balloons. The kid whose bag weighed the most got a prize. I conveniently used my Etsy packing scale to declare a winner. 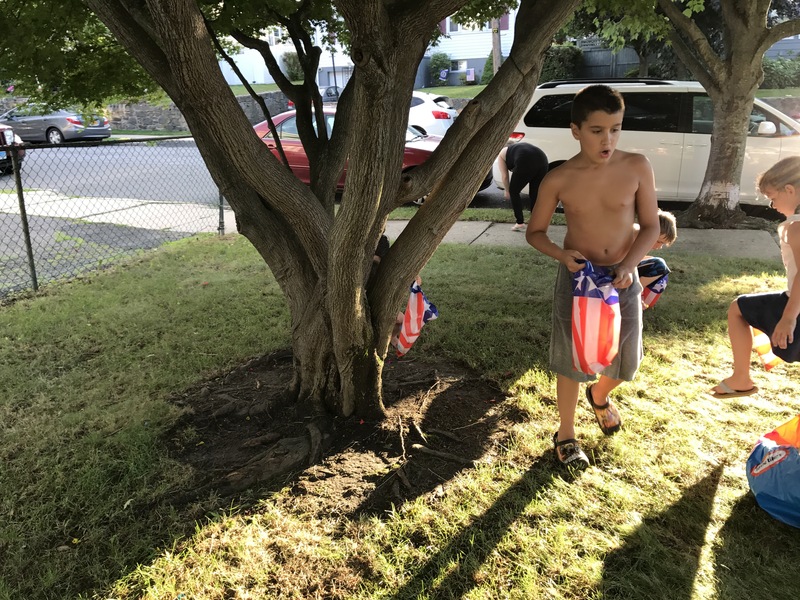 Because my brother-in-law had brought 1,000 water balloons, I was really happy the kids made a game out of cleaning them all up, although they are biodegradable. We have a beautiful firework show right down the block and my house has the perfect view. We played some Star Wars music and it was the perfect end to the perfect 4th of July celebration. I have spent the last 10 years watching these fireworks, except the year Bradyn was born and I was in the hospital. It makes me so happy to be able to share them with my children.